I am going through Beth Moore’s study, Living Beyond Yourself: Exploring the Fruit of the Spirit. I have been through this as well about three years ago, and I am learning new things and reinforcing others from last go around. Beth is such a passionate speaker, and she has a love of God, and heart for knowledge and teaching that I didn’t mind doing this a second time, after all going through the first time I had an infant. At the time of writing this the previous week’s study was on faith. I love how she highlighted that faith was not an action, but a response. A lot of faith is refined through suffering. Being tried in the fire. But we have to have belief that God will do as he promised and be with us through the trials. When you walk through the fire, you will not be burned,the flames will not set you ablaze. I give Egypt for your ransomCush and Seba in your stead. She said that she has learned that when she can’t see his hand, that she has learned to trust his heart. This is hard for me because I want so much to see his hand, I want to understand, I want to know the next steps. But I can sit back and trusts my God who is the same today as he was yesterday and will be tomorrow. 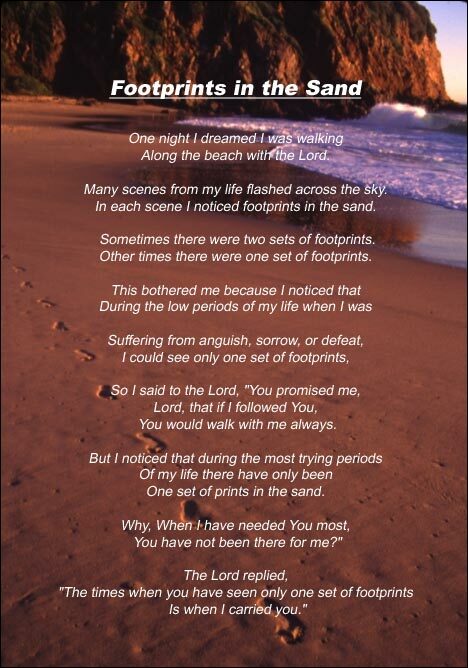 (Hebrews 13:8) I think about the footprints in the sand illustration that my aunt used to have on the wall.